We’ve been delivering quality chiropractic and wellness care to the Ottawa area community since 1985. We are not the typical chiropractor in Ottawa — we take a multi-disciplinary approach in helping to provide suggestions, options and solutions for even the most difficult of conditions. We work with all specialties if necessary. Being a Ottawa, ON Chiropractor for over 25 years, I have built a network of professionals from many countries that I can tap into for the latest cutting edge information. 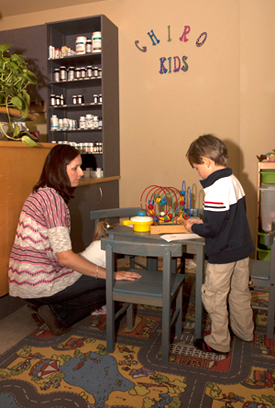 We have a fun kids area where children can play before and after their appointment. We pride ourselves in providing a very loving and supportive environment where we partner with the patient. We use a patient-centered wellness approach where health challenges, be it from physical, chemical or psycho-emotional origins, can be addressed in a safe and nurturing environment. This means that we seek people that agree to take a very active role in their recovery and are willing to make the necessary changes that will maximized their results. Wouldn’t it be great if we could empty the hospitals of most of the chronic disease conditions and use the hospitals for what they do best–Urgent and emergency care. Because I am a Ottawa, ON Chiropractor and know the amazing benefits of chiropractic care, I get especially discouraged at the growing number of children being admitted to CHEO (Childrens’ Hospital of Eastern Ontario) and wonder, if they are having so many challenges as kids, what does the future hold for them as adults? What will be their quality of life? Our mission here at Optimal Health Family Chiropractic & Wellness Centre in Ottawa is to promote the optimal expression of a family’s health and wellness through the attainment of physical, mental and spiritual wellbeing–the natural way, without drugs or surgery. Regardless of your health goals, please understand that we see ourselves as guides or health coaches. You’re the boss! It’s your body, your health and your future. Our job is to offer you the finest chiropractic and wellness care possible, and it’s up to you to decide how much of it you want. Sound interesting? Please contact our Ottawa chiropractic office to make an appointment today.